Managing your commercial septic system begins with knowing you have a reliable commercial septic company in Tampa. At Southern Water and Soil, we understand that managing your commercial septic system can often begin with knowing you have a reliable commercial septic company available to provide the services you need. Whether it’s a minor repair, routine maintenance, or completing installation, having a team of septic professionals to assist you can achieve the best outcomes for your business. Our team at Southern Water and Soil has over 30 years of experience providing septic solutions for commercial businesses, and you will find that we are your commercial septic company of choice in Tampa, Florida. Permitting – As a commercial septic company, we understand that having the proper permits is an essential step in the setup and operating of your business’ septic system. We are knowledgeable about the requirements for commercial septic installation and maintenance and can help with the permitting process. Design – Are you breaking ground on a new commercial business that will have a septic system installed? Allow us to provide the expert design services you need for the best outcomes as your business gets ready for opening. Installation – At Southern Water and Soil, we are equipped to address all types of commercial septic system installation, whether you are starting from scratch or replacing a specific part. 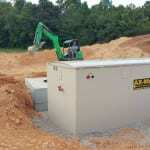 We can work with you to design and install the septic system that will work best for your business facility. Maintenance – As a commercial septic company in Tampa, we always recommend routine maintenance and servicing of your septic system. We’ll be happy to discuss the maintenance schedule that will ensure your septic system is effective and efficient year after year. At Southern Water and Soil, our commercial septic company proudly serves Tampa, Odessa, Lutz, Land O’ Lakes, Brandon, Orlando, Plant City, Dade City, Bartow, Lake Wales, and Lakeland, Florida.